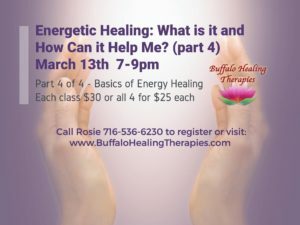 What is Energy Healing anyway? Do you know it is formally practiced in different ways and has many forms? There’s Healing Touch, Reiki, Therapeutic Touch, Quantum Healing, EFT (Emotional Freedom Technique) to name a few. This is an interactive class where you will experience what it is all about and how to activate your own energetic healing system. Walk away with easy techniques that help you clear your field of “energetic debris” and learn how to “run energy”. You will have an opportunity to share your experience with others in the class as you practice the actual techniques. This course is an awakening to your own healing abilities. It is a precursor to the actual teachings of Healing Touch, Reiki, Quantum Touch, Therapeutic Touch, Theta Healing or EFT. It will help you determine your direction or simply help you know what is available to you. 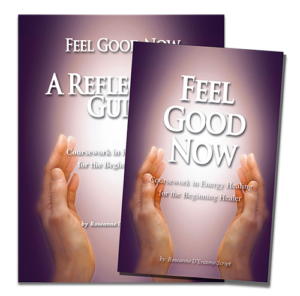 Roseanne’s latest book – ‘Feel Good Now’ with Reflection Guide (a coursework in energy healing for the beginning healer) is needed for this class.